A 15-minute interactive fire safety awareness course has been developed to ensure the University of Warwick complies with fire safety legislation. The module includes tips on how to prevent a fire, what to do upon hearing the fire alarm, and how to summon security assistance. The course is available for all new and existing staff, including postgraduate researchers. You can self-enrol, access and complete the course on Moodle. Risk assessment is a vital tool for ensuring that activities across the University are carried out safely and with minimal risk to the health and wellbeing of staff, students and visitors. We carry out risk assessments to ensure we’re identifying any existing or potential hazards – and with that knowledge, we develop measures to eliminate, reduce or control the risks. These risks might be to people, property, the environment or our business – whatever the focus, the aim is to produce safer and healthier conditions in which we all work, study, live and play. The 25-minute interactive eLearning module is designed to help staff and students to understand risk assessment. It is now available to complete online. If you require a comprehensive knowledge of what a risk assessment is and how to write a risk assessment in accordance with the University’s policy, guidance and UK Health & Safety laws, you can self-enrol, access and complete the course on Moodle. • colleagues behaving appropriately in response to an alarm activation. The only way to test that the fire arrangements in all buildings are robust and working is through planned fire evacuation drills. As a result, fire evacuation drills will be carried out across all buildings throughout the academic year 2017-18. • Locate and read your nearest ‘Fire action’ notice, which is a blue sign next to fire exits and on the back of doors in accommodation blocks. • Make sure you understand the action to take in the event of a fire – familiarise yourself with your escape route(s) and emergency gathering point. • If you detect a fire, raise the alarm using the means available and evacuate immediately. • If you hear a fire alarm, evacuate immediately. It could be a real fire – do not assume that it is a drill. • Do not re-enter the building until you have been given permission to do so by a member of the emergency response team. • If you notice any problems with any fire safety measures (such as detectors, alarm points, signage, escape routes or extinguishers) report them immediately to your manager/supervisor/academic tutor or through the Health and Safety or the Estates helpdesks (available via the respective websites). Click here to see what you should do in the event of an emergency. If you bring contractors into the University to conduct work on the University's behalf, then the revised contractor pages contain relevant health and safety information to help you discharge your health and safety responsibilities. The pages also include a link to the SSiP portal, a link to the University's health and safety validated contractor list (and their current status) and the NEW contractor Health and Safety Induction video that should be used to induct all contractors coming onto the University to carry out work. The Estates Department have developed a Code of Practice outlining the general requirements and options available within departments for the Inspection and Testing of Portable Electical Appliances. Heads of Department, Senior Administrators, Technical staff and Managers with responsibilty for 'PAT' testing should read the document available here and take actions as necessary. The University of Warwick's guidance on the health and safety responsibilities of senior officers, heads of departments, managers, supervisers, staff and students, a document entitled 'Leadership and Management of Health and Safety', has been developed and approved for issue. It is available via this link. 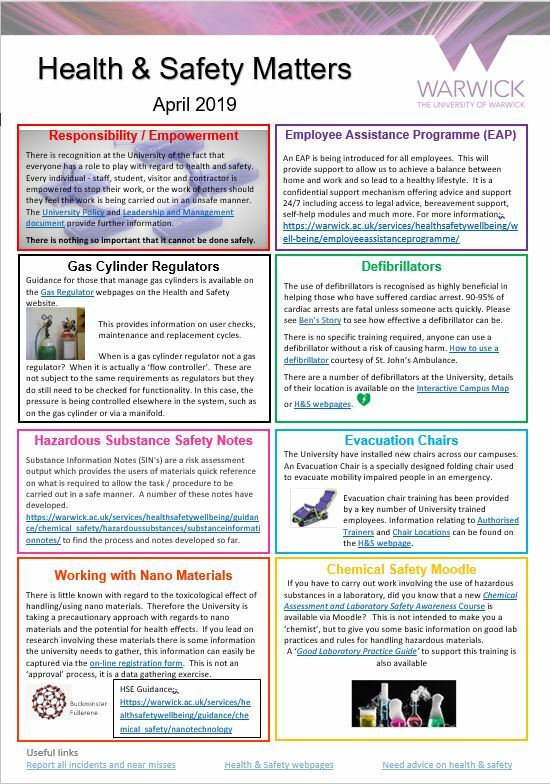 If you are responsible for research please click the link to the latest safety bulletin where you will find links to The Responsible Research document. This provides advice and guidance as well as case studies demonstrating how you can conduct suitable and suffient risk assessments to manage the risks involved. This bulletin outlines the recent prosecution of a university where they failed to do this. Evacuation procedures have been established for the Gibbet Hill campus which include the implementation of the Evacuation Tag System, and the creation of a Local Incident Response Team.